The kids were split up into seven groups: one at the cemetery, one at the schoolhouse, two at the church and three at Squire's Tavern. A bus was used to rotate the groups every two hours so that each group visited the activities at each site. The weather was warm and sunny, the blue sky providing a cheerful tone that added to the excitement of a day spent outside the classroom. 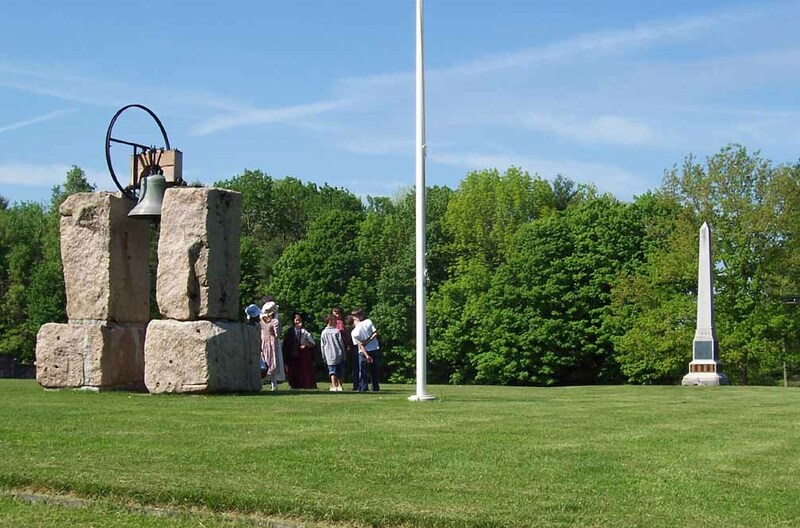 In the days leading up to the outing, the students had completed a number of classroom lessons that provided background on Barkhamsted history. The lessons covered topics that included the Barkhamsted Lighthouse legend and the people of the Lighthouse community. Background on the one room schoolhouses in Barkhamsted was also covered. Much of the schoolhouse information was written by Harriet Day Bouteiller and was based on her personal experiences as a student at the Barkhamsted Center schoolhouse. The children studied the 12 school district arrangement used years ago by the town, and located the schoolhouse they themselves would have attended if the clock were turned back to that earlier time. Now it was time to visit the four historic sites and take in the sights, smells and history of each location. The students were dressed in old style clothes to help set the appropriate atmosphere for the day. At the Squire's Tavern, three separate groups concentrated on different topics. One group was treated to a tour of the Tavern by Historical Society President Walt Landgraf. The students learned about how the Tavern was operated, and how the Tavern was actually just one part of a large farm operation that included hay fields, pasture land, livestock and outbuildings. Of particular interest to the students was the newspaper account of John Ullmann's death on the farm after being tossed in the air by an enraged bull in 1924. Another group learned about the early American occupation of tinsmithing and actually worked a piece of tin, punching indentations to form the shape of a schoolhouse. The rat-tat-tat could be heard throughout the Tavern as the students completed their task. A third group at the Tavern worked on a toy that was popular in the 19th century. It was called a thaumatrope, and is comprised of a card with a picture on each side. When the card is attached to two pieces of string and rotated rapidly with your fingers, the two images appear to combine into one in an early form of animation. The students completed their thaumatrope using the images of a spider on one side and a web on the other side. 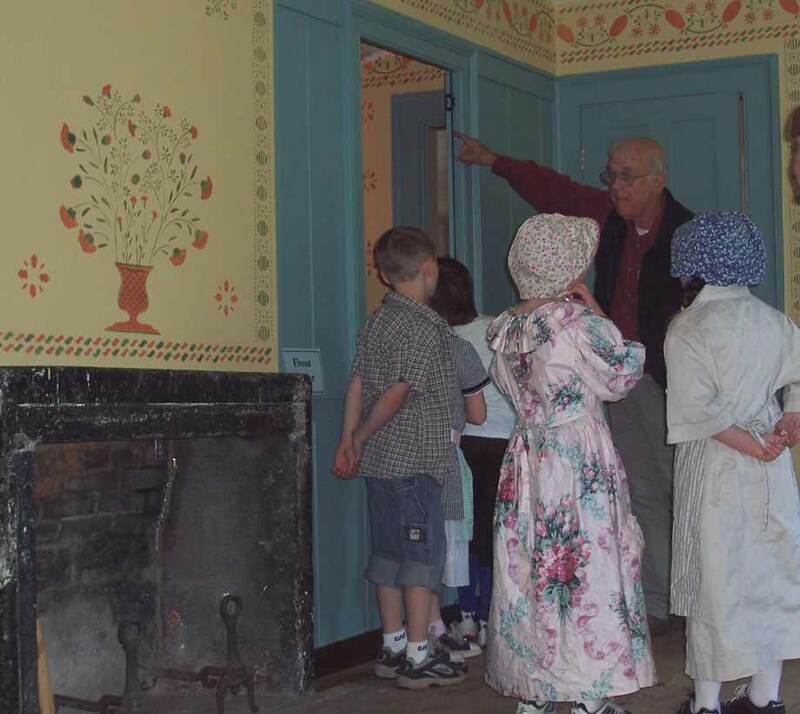 Photos above- At left, Walt Landgraf points out features in the front parlor of the Squire's Tavern to third grade students. At right, students work on a tin smith project in the ballroom of the Squire's Tavern. Meanwhile, two student groups enjoyed activities at the Barkhamsted Center Church. The outside group participated in a variety of old time games, including marbles, walking on stilts, shooting a slingshot, and two early baseball-type games called "peggy" and "bases". Inside the church building, a group learned about the history of the Center Church. They also studied herbs and the uses of herbs. The children combined several herbs and produced a "moth chaser", a cloth pouch filled with a mixture to keep moths away from clothing. Photos above- At left, students sample old time games including walking on stilts. At right, a lesson at the Center Schoolhouse. 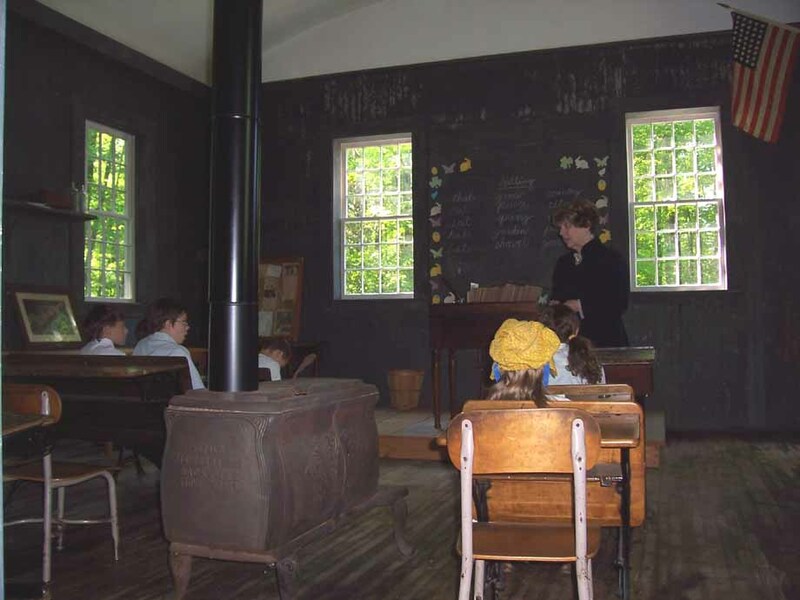 At the Center Schoolhouse, the group of students sat at the old school desks surrounding the large woodstove and learned about school life in the old days. Mrs. Webb conducted this session. She is a professional schoolmarm specializing in presentations on early school programs. She introduced her pupils to the old time traditions including: boys on one side, girls on the other; bows and curtsies to the teacher; old text books; spelling and recitation lessons; quill pens; classroom discipline and stories. The Center Schoolhouse is a great environment for this presentation. 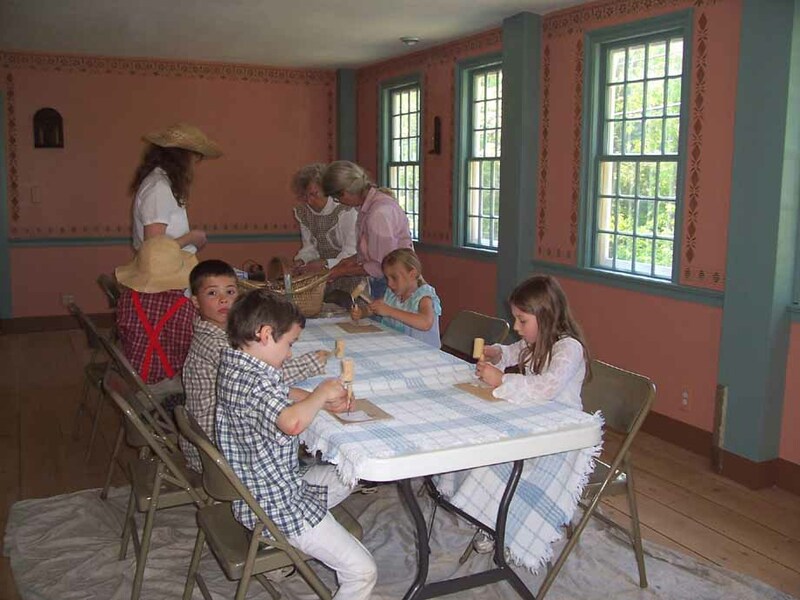 The Historical Society has restored the building inside and out to appear as it did years ago, which helps the current students take in the flavor of the one room schoolhouse experience. At the Center Cemetery, the students inspected different sections and gravestones. They learned about the settlements in the area now covered by the Barkhamsted Reservoir, and how several cemeteries there were relocated to the current site. Some of the graves moved were unidentified. These were all put in the "Unknown" section of the Center Cemetery. The students learned about some of the early settlers of Barkhamsted such as Peletiah Allyn, and about prominent citizens including Dr. Amos Beecher and Reverend Ozias Eells, first settled pastor of the Congregational Church. And of course the group visited the gravestone of Rachel Mack, whose stone is inscribed "DIED Feb. 31, 1831". Photo above- Students learn about the history behind the Barkhamsted Center Cemetery. The day was fun and informative; the children took in a slice of Barkhamsted history and early traditions. The students had a snack of lemonade and cookies in the morning and at lunch time opened their old style lunch pails and baskets to eat outdoors, either on the grounds of the Church or at the Squire s Tavern. By the end of the day each student had experienced sights and lessons at each location and was bussed back to Barkhamsted Elementary, and back to the 21st century.